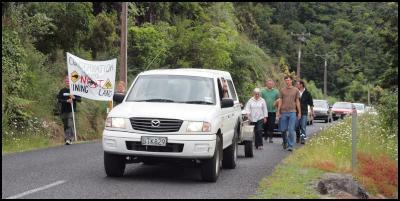 Local residents and anti-mining group Coromandel Watchdog today blocked Newmont mining activities in forestry and conservation land in the Kauaeranga Valley near Thames and then escorted them from the valley. 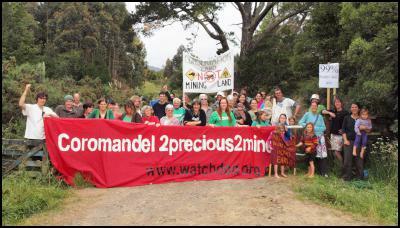 Local residents stood shoulder to shoulder with Coromandel Watchdog preventing Newmont staff from entering an area where they had been carrying out ground resistivity tests which would identify potential gold deposits. The company staff then decide to leave the valley and were escorted out of the valley by 50 people waving banners saying “No Mining”. Former Green's co-leader Jeanette Fitsimmons and Green MP Catherine Delahunty who live adjacent to the exploration permit supported the protest. “We know that Newmont and other mining companies have applications or existing permits to explore a large part of the northern Coromandel, and part of this is in Schedule Four land, “ Ms Annan says. Ms Annan says that local residents are determined to protect Coromandel from any more mining and are very concerned about the toxic legacy recently identified in a subdivision in Thames.